Pokerville Ironworks is your headquarters for complete service on Harley Davidson & American-Made Motorcycles, simply put, we're the best resource for all your motorcycle needs. Count on us to perform ALL MANUFACTURERS' recommended service and maintenance. At Pokerville Ironworks, we deliver what you need on time... Nothing leaves our shop until it is completed properly. Our inventory also features a complete selection of parts and accessories for all your riding needs. Don’t forget, we offer full service detailing for your bike. Our service department is one of the most experienced and thorough in the country. Our work on street rods and muscle cars is the best-kept secret in the industry! You may think of Pokerville Ironworks as a shop that is exclusively for custom bikes... But don't be intimidated by the quality of our work! We provide service for all Harleys! We specifically cater to all audiences. We treat all our customers equally and with respect. We strive to meet all of your custom needs by offering the best brands in the business. We offer full service custom painting, and we're ready to transform your ride! If you need any welding or machining services just ask us for details. Thanks for selecting Pokerville Ironworks, where we offer our customers a service to also take care of their daily drivers. So if you need a set of tires or want to upgrade your rims we can handle that for you. Please keep us in mind if there is something that we can help you with - after all that is what we are here for! We strive to meet all of your motorcycle needs by offering the best brands in the business. Come Join Us at the Red Mouse for Bike Night every Wednesday 5:30 to ?. Service Area: Mt. Horeb, Madison, Waunakee, Sauk City, Mc Farland, Monroe, De Forest, Cottage Grove, Brodhead, Baraboo, Prairie Du Sac and surrounding communities. Please call us BEFORE sending anything to us via USPS to ensure proper delivery. © 2013 - 2019 Pokerville Ironworks, All rights reserved. 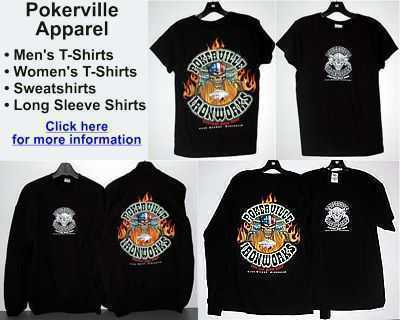 Page Summary: Pokerville Ironworks offers custom motorcycles, harley davidson custom, custom bikes and chopper motorcycle. Products and services such as harley custom, harley chopper, custom chopper as well as custom bobber are also part of the scope of our business. We also specialize in unique motorcycle, custom motorcycle shops near me in Mt. Horeb, Verona, Madison as well as Middleton. Other areas we serve include Oregon WI, Waunakee, Sauk City and Dodgeville. We also service Mc Farland, Monroe and beyond.